My in-laws gave me a wonderful gift basket for my birthday, filled with lots of yummy breakfast foods. I try very hard to eat healthy, but I have to admit to a weakness for jams. So I've been in breakfast heaven this week, sampling lots of different fruity spreads. I've also been enjoying a bit of summer in February with these beautiful fresh raspberries. I have to admit that I bought them so that I could photograph them (how pathetic is that?!) but now I've been snacking on them. And that's healthy eating, right? We're supposed to be getting a snow storm tonight into Saturday, so we're planning on sleeping in and making pancakes in the morning. With wild Maine blueberries, courtesy of my breakfast basket. 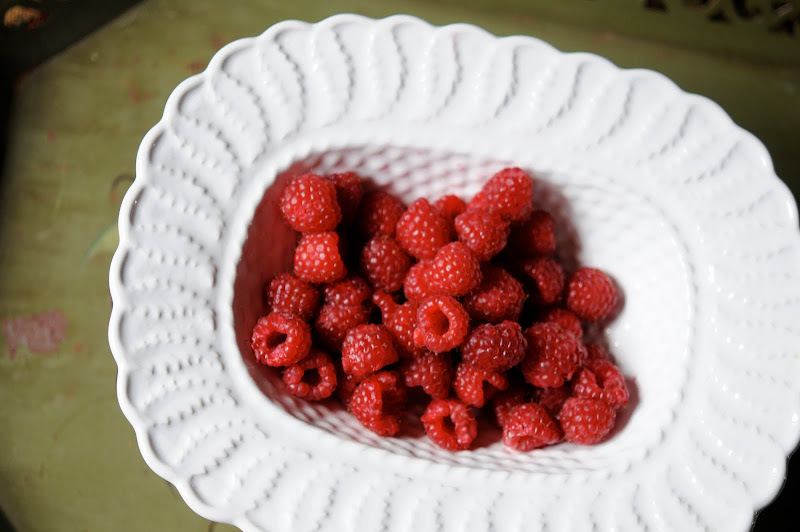 These raspberries look gorgeous on the white plate. Makes perfect sense to buy them for a photo shoot!! My favorite combination is raspberry and dark chocolate-yum! oh i love jam in the morning and a glimpse to your beautiful surroundings! tomorrow - no clue. the way everyone is talking, i am wondering if i can make it into dc on sunday. your raspberries look gorgeous and raspberries and peaches are always a great combo. I just might have to go back and get some. We love them too. I can't think of a better reason to buy rapsberries! They are qite photogenic! Opps, didn't catch the typo. That should be quite not qite. My laptop has a terrible keyboard, I am forever missing letters! Your photos are just beautiful! You turned raspberry jam into a work of art! Enjoy those raspberries Mary--they're good for you. I love that white bowl that they're in. It looks so familiar to me. They look absolutely delcious, I love fresh raspberries! I would buy some too but I would probably be thinking more of eating than taking pictures! Your pictures make my mouth water. . . I'm shamelessly going to promote our jellies. I have a store called The Rug Cottage in Iowa City Iowa. We have our own brand of fruit spreads that contain NO SUGAR!! They are sweetened with fruit juice. We have 14 flavors available including red raspberry, black raspberry and red raspberry rhubarb. Check out our web site www.rugcottage.com. We ship. I'm a new blogger. Our blog is rugcottage.blogspot.com for the Rug Cottage & iowabarntiques.blogspot.com for our antique mall. 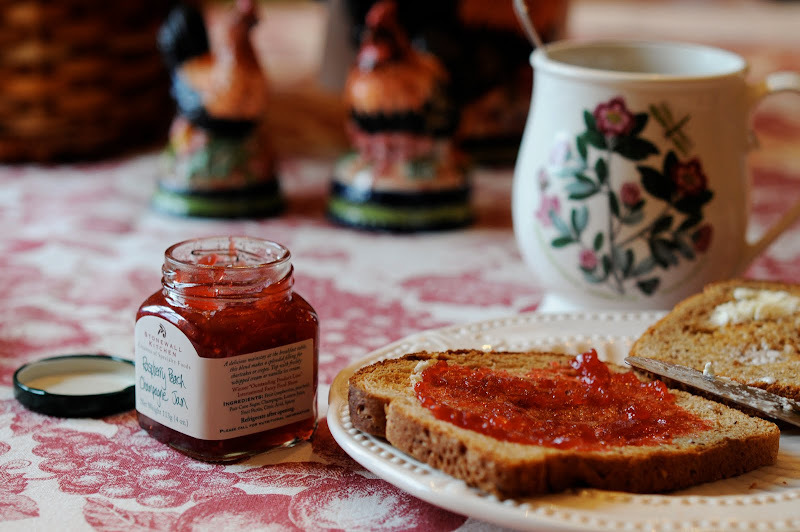 Our fruit spreads are fabulous... we have shipped them to all 50 states and England. I really enjoy your blog. There are so many creative people blogging... and you are one of them. I'm just trying to learn as I go along. Thanks for letting me promote our jelly. Oh Yummy! I bought a cranberry - jalpeno jelly at a craft fair this fall and it was so good. It didn't sound good and I bought it for my son-in-law who likes anything 'hot'. Enjoy your snowy weekend, there can be nothing better than to stay home on a cold snowy day. Oatmeal. Dull old oatmeal, but then I have no reason to celebrate since a big snowstorm is not coming my way. LOL! Enjoy the day, and, yes, the raspberries are wonderful and may I also suggest some Raspberry Zinger tea from Celestial Seasonings? Raspberry jam! My favorite! And yes, raspberries are good for you! Enjoy1! I enjoy your blog so much Mary and am inspired by your photos and love your commentaries. OMGosh, it's pathetic to buy something just to photograph it? Damn, then. Not gonna make me stop, though! Pancakes sound good for breakfast tomorrow. And I love Stonewall Kitchen jams. Yum! Oatmeal with frozen blackberries and homemade maple ice cream stirred in! The jam sounds like just the thing for a snowy weekend. I bought milk so I'm thinking I'll have hot chocooate while I'm snowed in tomorrow! Nothing as good as you are having. Those raspberries would be long gone.. I can devour them in record time, and yes they are so good for you! Enjoy your snow, we are immune this time around. I have fresh eggs and toast every morning, sometimes with a bit of bacon:>) Seeing this reminds me that I really need to bake some fresh bread for my toast, and we have some fancy jams in the pantry...maybe time to try some. The raspberries look gorgeous, and eating them makes buying them to photograph not so silly don't you think? good day Mary, my breakfast was a small greek yogurt, with banana and honey and a piece of chocolate bundt cake with coffee! i wish i had done better. i am just living vicariously through you and your meals...plus i ate mine standing up. The raspberries are perfect. Perfect to photograph and perfect to eat! Where Did All This Blue Come From?